I rented a Clarke FM series commercial floor polisher. Using the brush attachment, I was able to remove most of the remaining glue residue in about 30 minutes. Using a rented commercial floor polisher with brush attachment to remove old carpet glue residue prior to leveling floor. After the floor polisher did its job and freed up the old carpet glue residue, I just vacuumed up the residue. I did need to do a bit of hand removal work close to the walls and in the corners that the floor polisher could get to. Finally down to the bare slab, I was ready to proceed with leveling the concrete slab floor. If you look closely alone the inside wall and you will appreciate just how sloped the floor is — nearly 3″ low half way across this 12′ span! Prior to leveling the slab, you should check to be sure any structural / support issues are addressed prior to leveling the floor. Additionally, ensure that the floor to be leveled can handle the weight of the material to be added for the leveling process. So to get started, I used premixed bags of high strength Portand cement mix (fortified and fiber reinforced) for the first layer and to fill in most of the deficits. To feather the edges of the coarse rock aggregate, I used a sand mortar mix fortified with latex. The final leveling layer used the more expensive self-leveling underlayment mix. The results were fantastic. The less expensive concrete worked well to fill in the the majority of the low spots and allowed me to use much less of the more expensive self-leveling underlayment mix. I saved well over a thousand dollars by using this multiple material in layers technique. The trade off was time. The concrete needed 3 – 4 weeks to cure prior to applying the floor leveler, requiring over a month to complete the entire process. 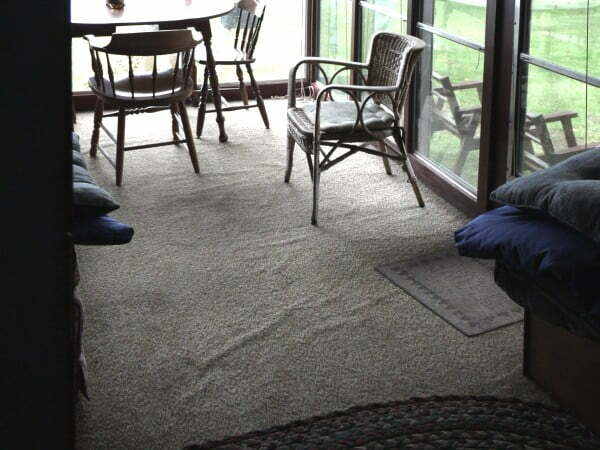 Prepare floor by clearing floor of all furniture and items. Floor must be clean and prepped according to the manufacturers recommendations of the concrete or fill product you are using. For this project I removed the old carpet and the carpet glue/carpet backing residue with a rented commercial floor polisher (Clarke FM series). The floor was then scrubbed with a household detergent and water. Floor clean and ready for latex primer coat prior to concrete. Prime floor with latex additive. 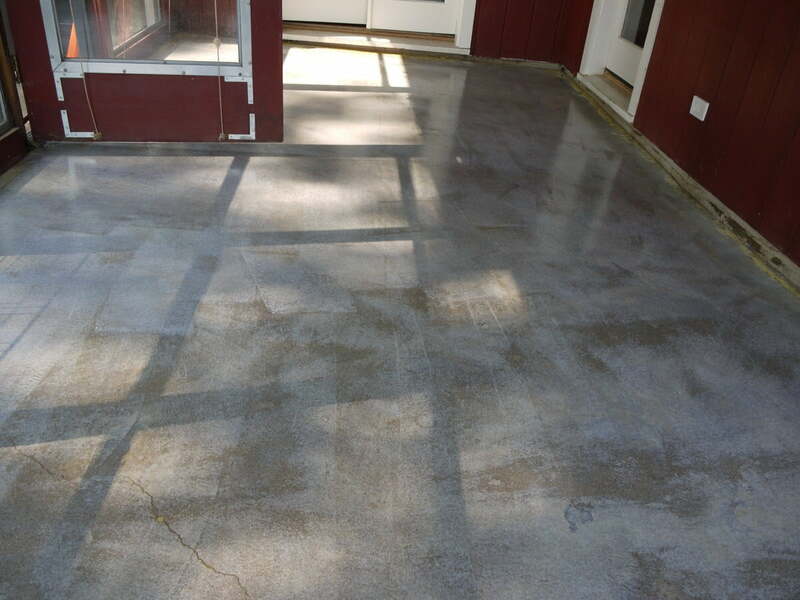 To improve the bonding of the concrete patch to the existing concrete slab, prime the floor by applying a coat of latex concrete additive (Patching & Leveling Latex Additive from Custom Building Products). I used the latex additive straight from the bottle and rolled it on with a 1/2″ nap roller. Of note, you should delay the latex additive application until you just about ready to pour your concrete patch. Bonding of the new concrete to the primed surface is best before the latex is completely dry. 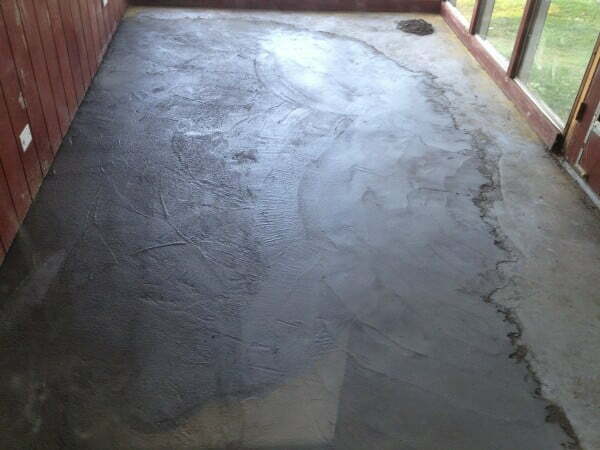 Concrete slab just after application of latex additive as primer coat. Prepare the slab for the first layer of concrete fill. Determine the floor deficit and desired amount of fill using a level, laser level or similar. An easy and inexpensive method is to use a string with an attached line level. Once you determine the desired floor level, create a method to mark this level and guide the concrete and self leveling mix pours. I was able to mark the wall and build an on floor guide using angle iron mounted to the wall. The angle iron guide also served as screed guide and allowed easy leveling of the concrete pour. You can also mark the floor to indicate where fill should end if the entire floor will not be covered. For the angle iron screed guide, I arranged predrilled angle iron along the floor as a reference to the desired depth of the pour and eventual surface of the concrete fill. Along the foundation wall I bolted short pieces of the angle iron to support the longer guides extending onto the slab. Once I adjusted the guides to the desired level of the pour, I secured the guides in place with Tapcon® concrete screws. Angle iron guides bolted inplace to serve as a screed guide and help level the concrete pour. 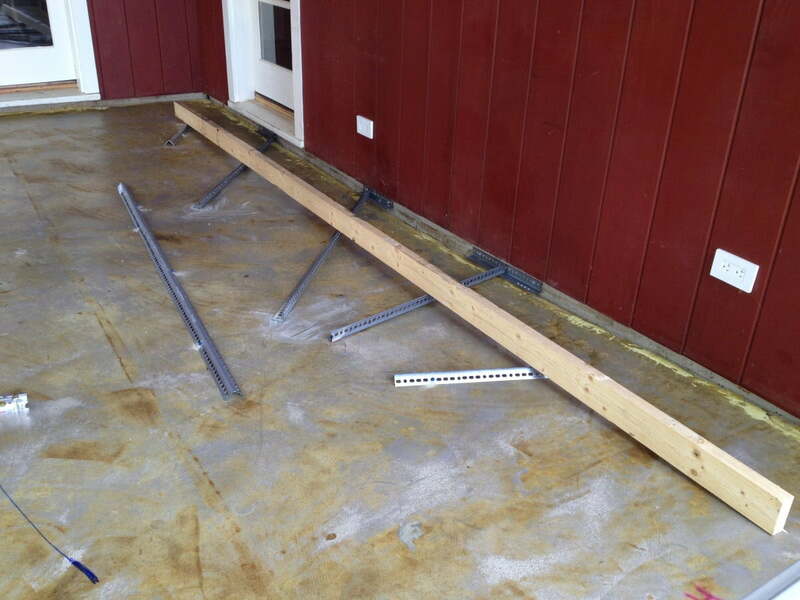 Checking level with a long 2×4 that I plan to use to screed the concrete pour. Mixing the first batch of concrete. 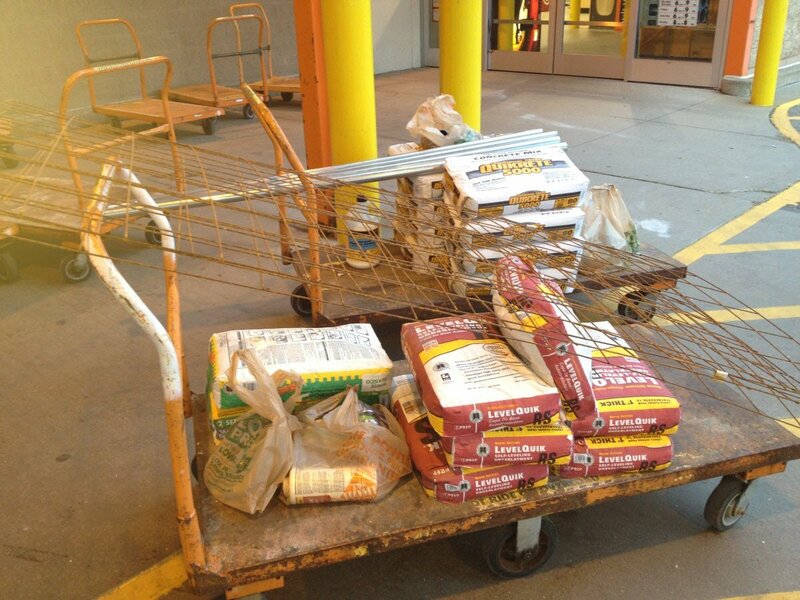 Rather than mix the concrete by hand, we rented a Kushlan electric wheel barrow style concrete mixer from Home Depot. The beauty of this mixer is the wheel barrow function that allows you to easily transport and dump each batch of mixed concrete. If you have not used a concrete mixer before, the preferred method is to sequentially add the dry mix to the water in the mixer. A common method would be to first fill the mixer with most of the water required for the batch you intend to mix. Most small mixers can easily a batch consisting of 2 bags of dry mix. Once the water is added to the mixer, start the mixer and add one half of the concrete mix for the entire batch (example; 1 bag if total batch is 2 bags) and allow it to mix fully. Next, slowly add the remaining concrete mix (the second bag). Once all the dry mix has been added and is fully mixed, add water to adjust the thickness of the final mix. Elena mixing the concrete for the first pour of concrete. Pour mixed concrete onto slab. Starting with the section of floor furthest from your access, dump fresh concrete and continue until the level was just at the top of the previously installed angle iron guides and comes just short of your on floor mark (if any). 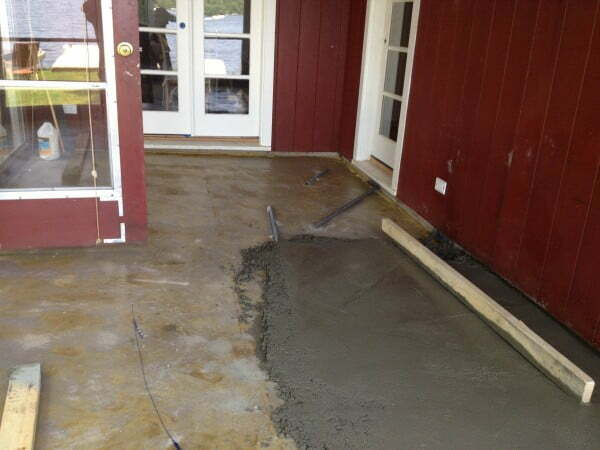 Then settle, level and screed the concrete using a length of straight 2×4 or similar. Finishing the concrete pour surface with a fine broom or textured finish to promote bonding to the to-be-applied self-leveling underlayment layer. 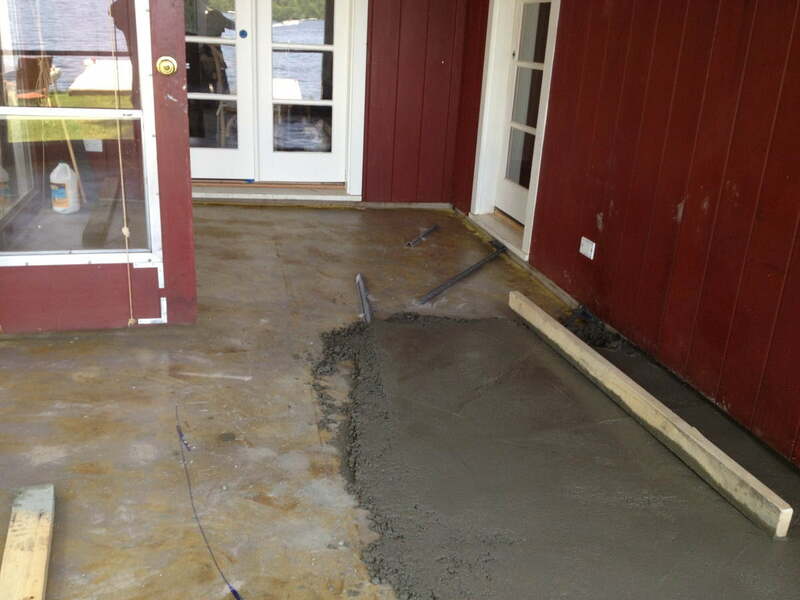 Use a straight 2×4 to settle and level concrete as you pour. 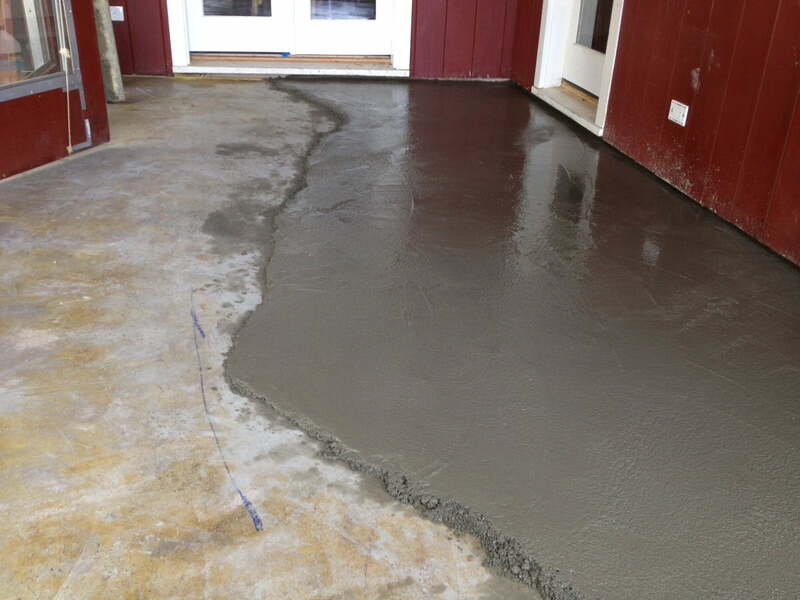 The concrete mix pour fills in most of the floors several inch deficit. Mix latex fortified mortar mix to finish the slab edges. Because the concrete mix used for the initial pour contains large aggregate (gravel, rock) it cannot be spread thin and feathered at the edges. Mortar mix, however contains only sand as an aggregate and therefore can be applied much thinner. Thin applications of mortar can be brittle, so I added a Latex to the mortar mix by substituting 50% of the required water with a latex additive when mixing the mortar. Once mixed, I applied the mortar to the edges of the concrete pour and used a float to feather the edges to the slab. Latex fortified mortar mix used to feather the concrete edges. Allow concrete to cure for at least 28 days. Allow the concrete to completely dry. This generally takes at least 28 days depending on the conditions and materials used. Remember to finish the concrete pour with a fine broom or textured finish to help with bonding to the self-leveling underlayment mixture we will apply after the concrete has cured. Mix and apply the self-leveling floor underlayment mix. 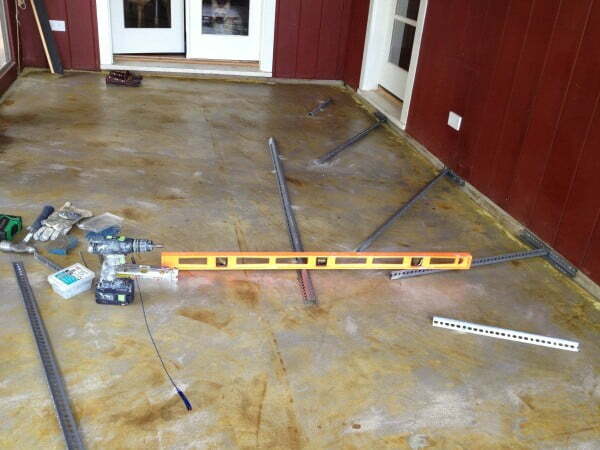 For the final layer of the floor, use a commercial self-leveling underlayment floor mix. 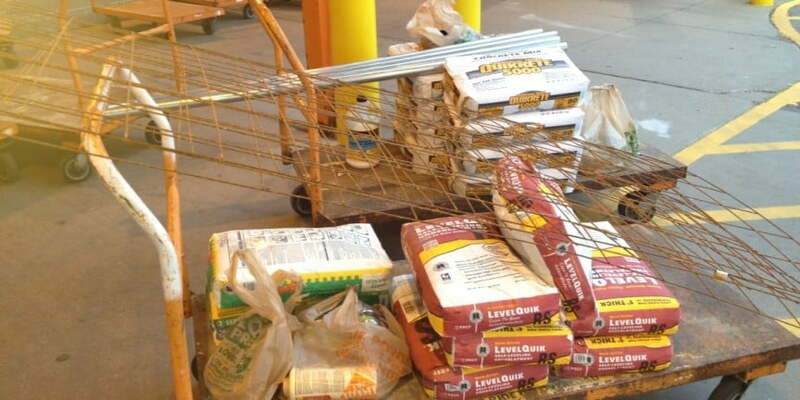 I used LevelQuik RS® from Custom Building Products. These products are specially blended Portland cement and gypsum mixtures that pour on, self level and are stable even when applied very thin. These mixtures set quickly and therefore need to be applied and leveled in an efficient manner. For this project, one of us mixed a batch in a 5 gallon bucket with a heavy duty 1/2 inch drill and mixing attachment, while the other poured and leveled the batch. 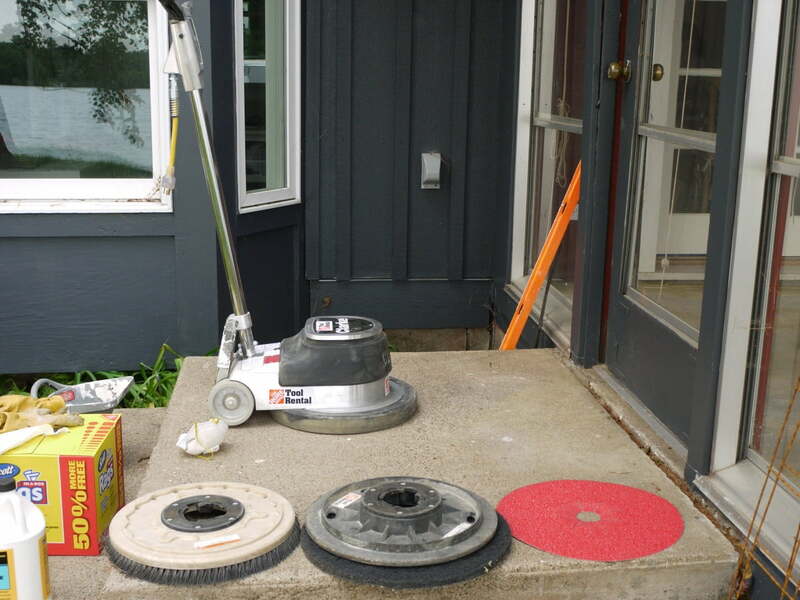 Even though these self-leveling products are mixed thin and designed to their own level, I found the use of a bull float very helpful to spread the product just after the pour. Once spread with the bull float, the product is good at self leveling. I apologize, but at the time of this writing I was not able to find the images of the self-leveler application. I will add them if found. Allow self-leveling product to dry and then seal floor. Once the self-leveling layer was dry, typically 4 hours for this Rapid Setting product, I sealed the entire surface with a brush-on waterproof membrane. This waterproof barrier is optional, but it is easy to apply and will impede the movement of water through the slab into the porch living area. It will also improve the performance of the eventual tile finish surface for this floor. Read the directions from the manufacturer for application recommendations for the specific product you plan to use. I used RedGard® waterproofing and crack prevention membrane by Custom Building Products. With the RedGard® product, the recommended technique is to apply a water diluted primer coat (1 part RedGard® : 4 parts water) to the self-leveling underlayment before applying the full strength product. 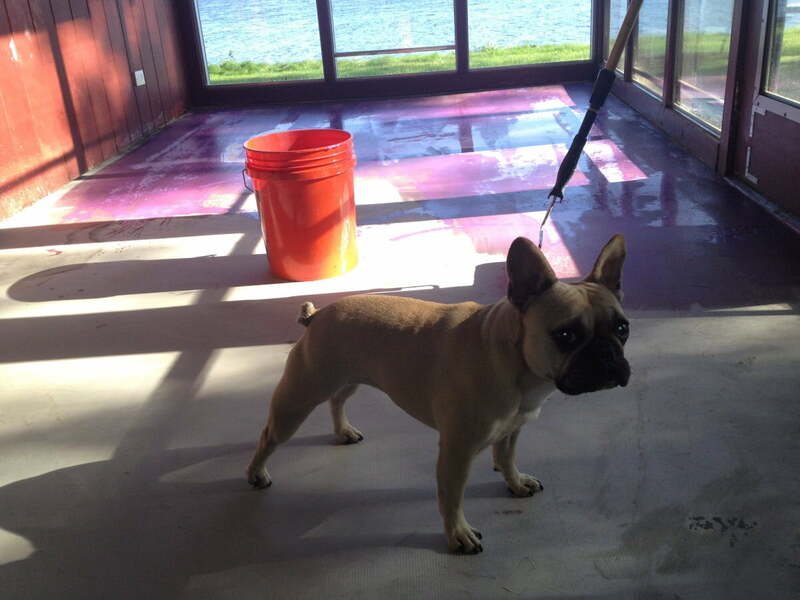 Applying a water diluted primer coat the the RedGard® sealant with Mangia, our French Bulldog supervising. After the primer coat is dry, apply at least one coat of full strength RedGard® membrane with brush, roller or sprayer. I used a roller. 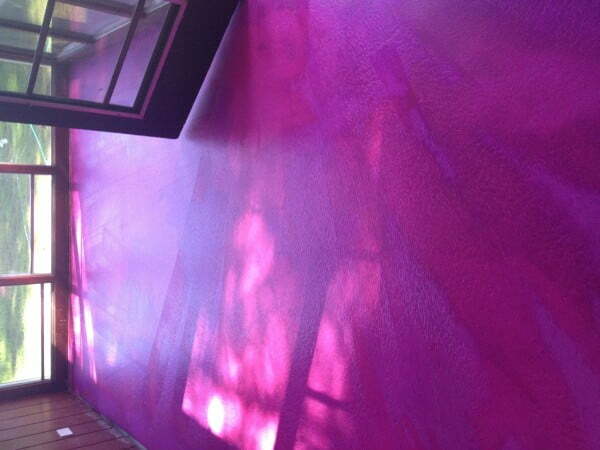 Waterproof membrane application drying – this product (Redgard®) turns red from pink when dry. Once the waterproof membrane is fully dry, up to 12 hours, the surface is ready for finishing. 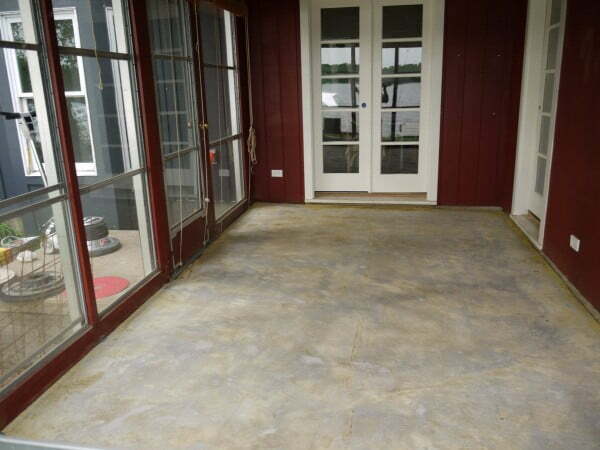 To finish this porch floor, we plan to add electric radiant floor heat and tile. Check back for a summary of the finish work! 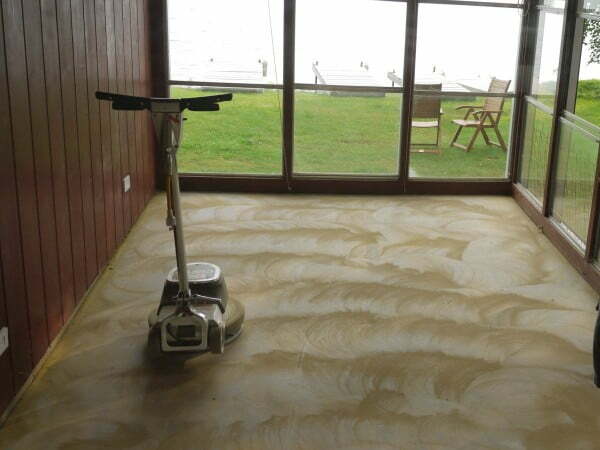 Rented Clarke floor polisher used to remove old carpet glue from concrete. Use a straight 2x4 to settle and level concrete as you pour. Latex fortified motar mix used to feather the concrete edges. Applying a water diluted primer coat the the Redgard sealant with Mangia, our French Bulldog supervising. 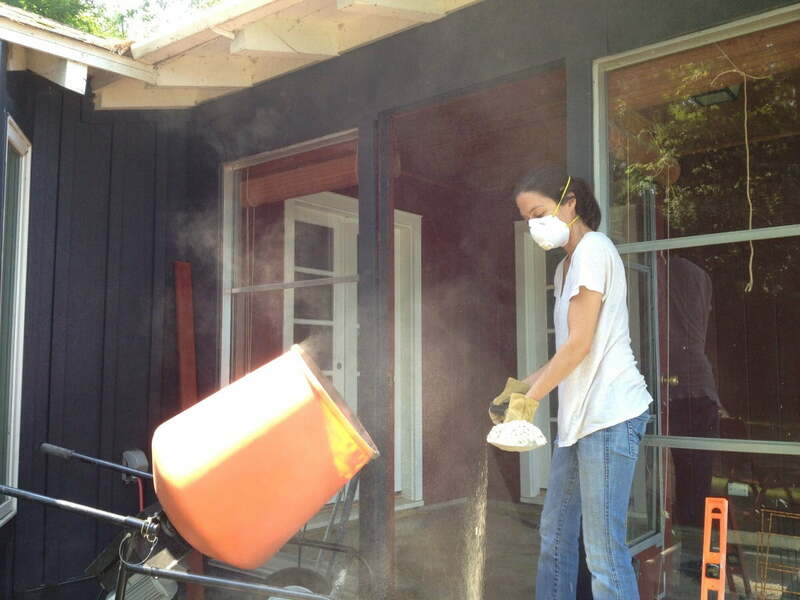 Applying a water diluted primer coat the the Redgard sealant. 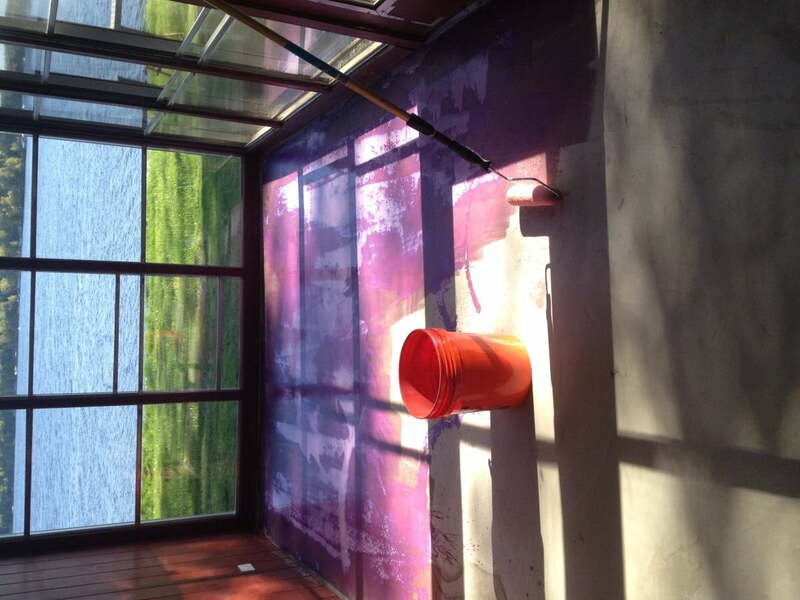 Waterproof membrane application drying - this product (Redgard®) turns red from pink when dry. Angle Iron – great method. I’m about to do an 800sq/ft basement pour (in sections) so that I can put porcelain planks on top. It was originally a 1915 pour so it needs some ‘freshening’. I was considering how to create the screed forms when angle irons popped into my head. Googled it and here you are. great minds think alike. I hope the Tapcons work easily. One thing I always seem to have trouble with – fastening to concrete. Good luck with the project. The Tapcon screws worked great for me, I drilled a pilot hole and had no problem. I have had issues with the screws breaking with not pre-drilling or using too small of a pilot hole. Was there any wait time between the concrete mix and the mortar mix? I waited overnight. I think you could make the argument to do it right away too. Completing the mortar edge immediately may have bond benefits with the fresh concrete. And, you can alway touch it up the next day if needed. The end result looks great. May give it try next time. I am looking into putting in new hardwood floors at my cabin. Once the tile came out, I could tell the concrete floors were not exactly level. You’re step-by-step was very fun to read and very helpful. I consider myself a handy guy, but I will probably end up getting a professional to do this part of it. Thanks for the info! About to do a similar project leveling my basement floor for tile and, like you I was wondering if I could do the bulk volume of the fill with cheaper concrete mix before self-leveler. Out of curiosity, how is this holding up? What was your final floor finish? It’s holding up great. We actually haven’t finished it yet – planning on tile eventually. We are waiting to finish the floor until we start a re-do of the windows for this room (porch).